We made it! Summer camping season is coming to a close and fall hike and fish season is right around the corner. Two weeks ago we started seeing the first flitter of the Chinook Salmon’s tail at Grave Creek boat launch, and a brief moment of cool fall air blew up the canyon as we launched one of our last camping trips. Fall is coming soon, and with it a whole new set of fun adventures in the Rogue River canyon. Many people are asking about smoke in our area due to the dry conditions and nearby fires. We have been lucky most days with only light smoke, sometimes getting denser for a few hours in the hot afternoons. The canyon has been hazy, but not altogether smoked in. All in all, we’re considering ourselves quite lucky this year having avoided not only fire, but also dense long lasting smoke. Another frequent question is our water situation. Although we are indeed in a drought, we are lucky enough here on the Rogue River to have a reservoir upstream that started full at the beginning of our summer. The water was then portioned out to last this summer season and into October, with fish habitat being the top priority. 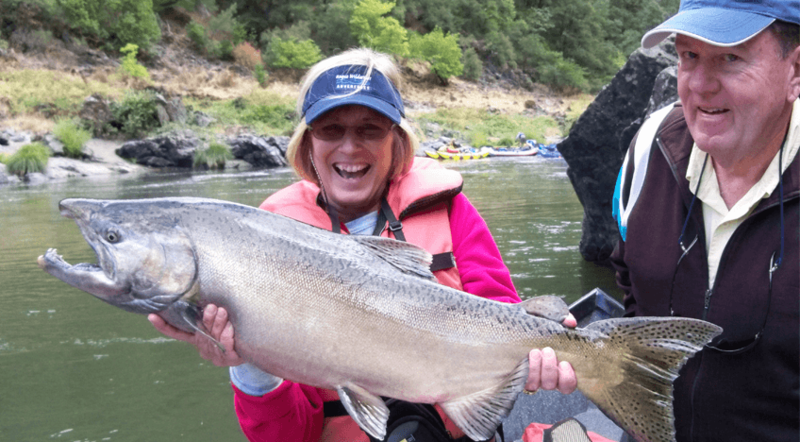 As we are now well into the fall salmon run, we are enjoying higher than average flows for this time of year- which has been a treat for fish and thrill seeking rafters alike. The temperatures have started cooling down, and the nights are coming sooner, making conditions perfect to start hike season. This season we will be hosting 12 hiking trips, 2 being our famous ‘Wiking’ trips featuring the best of Southern Oregon’s award winning wines. The lodges are ready to serve delicious dinners, offer hot showers, and provide a relaxing place to rest your head after a long day’s hike. Also, the trail is looking great with no major changes or updates since our spring hike season. Fishing season has been a big hit this year! With our expert team of guides and hungry fish swarming up the river, this season is set to be the best fishing season RWA has seen. The fall Chinook numbers are above normal and the numbers of half pounders are 57% higher than the 10 year average! RWA offers 3 and 4 day trips down the wild and scenic stretch stopping at several lodges including Black Bar, Paradise, and Lucas Lodge. So far this has been RWAs biggest and best season yet. We’re so thankful for our new friends and great memories. We can’t wait to get into the beauty and cooler temperatures of the fall- we hope you can join us! UPDATE: Great news! Due to the changing weather patterns and a shift in the winds, the smoke and haze have completely cleared out of the canyon. Blue skies and fresh air are here again!